The March Into Madness Has Begun Come Join Us! 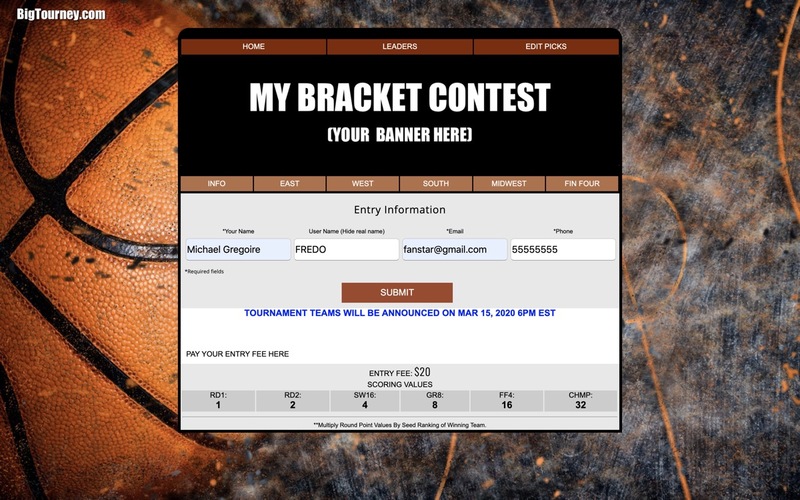 Manage your March Madness Bracket Pool Contest online with us. Get in on the excitement of this year's NCAA Men's Basketball Tournament and run your Pool With Unparalled Features and Automated Results. 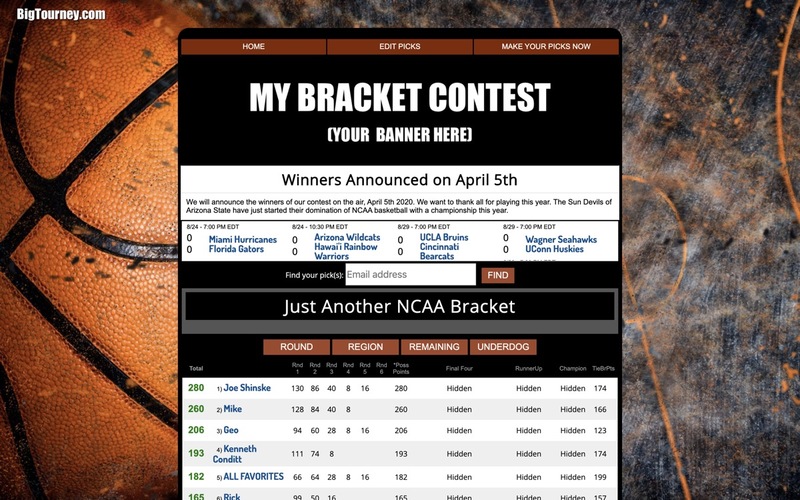 Experience The Best March Madness Bracket Manager For Your Contest! Come Join Us! Manage your March Madness Bracket Pool Contest online with us. 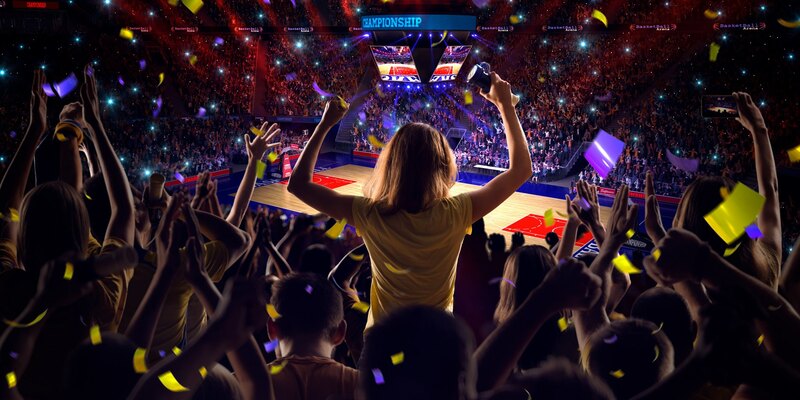 Get in on the excitement of this year's NCAA Men's Basketball Tournament with Unparalled Features and Automated Results. Manage your March Madness Bracket Pool Contest online with us. 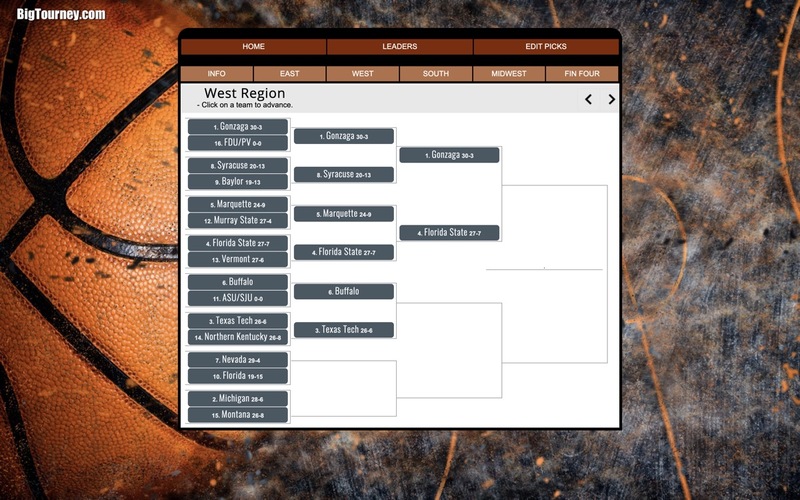 Get in on the excitement of this year's NCAA Men's Basketball Tournament with Unparalled Features and Automated Results. Customize questions to get data you need. You provide the prizes, we do all the work. Email updates with results & your added promotion verbiage. 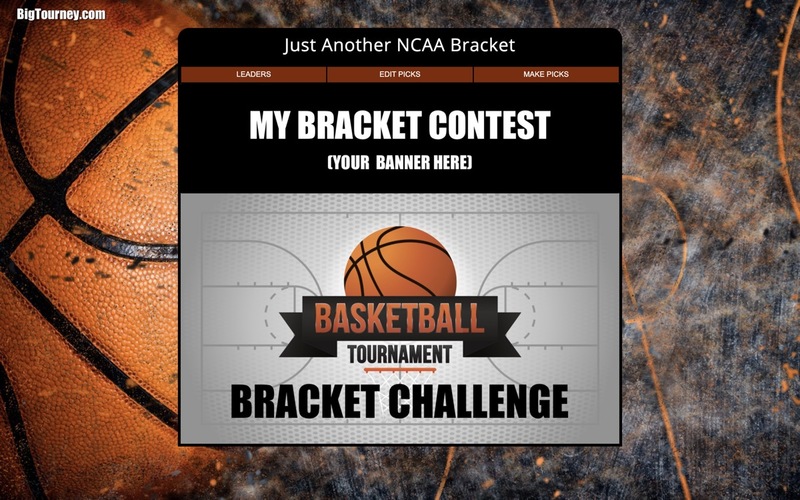 Just an example of the little details The Big Tourney sites provide: A generic splash screen for your march madness pool is provided on each site. 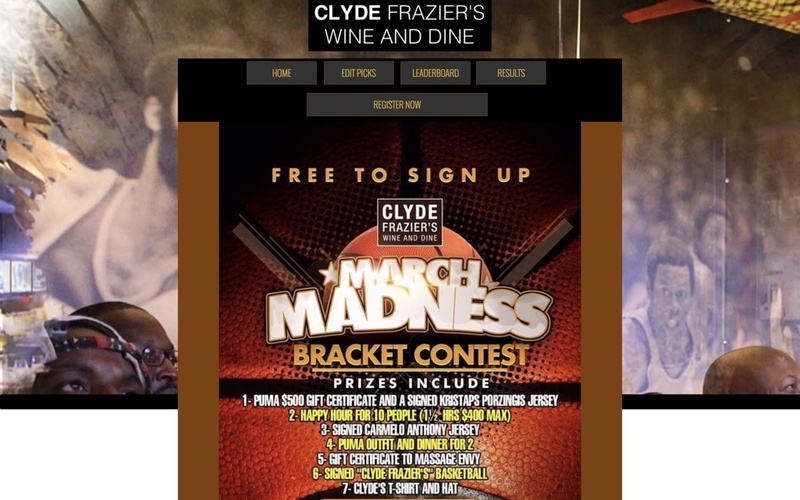 Other March Madness sites don't care to have an intro page, leaving the entrant without contest information. Our intro page, when customized by the user, provides contest rules and prize information. Commercial Version:We customize this screen for you or allow you to provide a graphic with exactly what you need to let your entrants know the rules. Further, everything on this screen from the background to the header can be customized to look like your website, making the contest site seamless with yours, thus providing the professionalism that you demand in rolling out a contest site. We Have That, and Then Some. Our sites update within seconds of college basketball game finals. Know where you are in the standings right away. And lest we forget, we have over 20+ ways to look at your bracket results, giving you unbelievable analysis of your pool. Commercial Version:Do you have regional contests? We can break down results by regional results as well as an overall leaderboard. 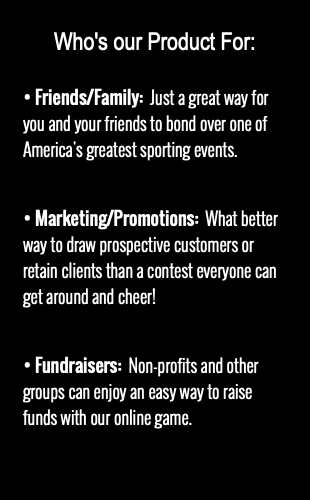 We can customize so it fits exactly with the type of contest design you have. Entrants have no central site login or registration for their ncaa brackets site. They simply are directed to YOUR march madness pool, unlike other office pool sites. Just click MAKE YOUR PICKS NOW button and are prompted to enter their basic info. Full name and email are the only required fields, the others are optional. And as stated, all your entry info is private. We wont sell it to anyone. Regions are entered one at a time, using larger fonts making it easier to see what you are doing. This also reduces the mistakes of not filling in the complete bracket (The site validates form before submission to ensure all picks are made). A confirmation email is sent to the entrant and administer of contest. Commercial Version:We can customize the email confirmation being sent to the entrants with verbiage you my want to provide on products or just a thank you for donating (fundraisers). Also, We can brand each entry region with a trademark logo (upper right corner 100x100) to help promote different products you may be pushing. Great for acknowledgements in fundraisers for those that have helped.